Modern Gurukul Home of the Teachers. Shri Ramswaroop Memorial Public School (SRMPS) is a humble beginning in the enormous field of academics with a mission of developing confident individuals, infusing intense patriotic feelings, generating leadership and team spirit qualities and above all love and cooperation for fellow human beings. The School realizes its mission through the able guidance of the Advisory Board and Management. SRMPS believes in the concept of a “MODERN GURUKUL” – Home of the Teacher. The school aims at establishing a strong bond between students and teachers through its day boarding and residential nature. It seeks to break the shackles of mundane school life because it believes that the child is like a plant that needs proper nurturing and at the same time a ground, enhancing spontaneous and well-rounded growth. Further, the school is managed by a family of true professionals who are proud alumni of world class academic institutes like IITs, MIT(USA), University of Minnesota, University of Connecticut, KG Medical University to mention a few. 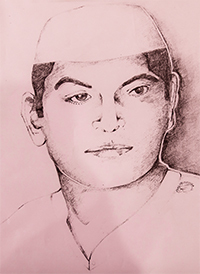 Born in 1921, in a small village called Dantil near Kotputli in Jaipur District in Rajasthan, Ramswaroop Agarwal belonged to the 10th generation of the Puraka family. He was the eldest of the three sons of Lala Chiranji Lal. After the demise of his father, Ramswaroop Agarwal had to take on the responsibility of his family at the tender age of 12. He tried to start a number of small businesses in several cities but finally settled down at Lucknow in 1947. He was a humble businessman, who gradually carved out a niche for himself in the business world of the day because of his idealistic beliefs, his integrity and other personal qualities. His life is long story of struggle, determination to overcome every adversity without compromising with his personal ideals and beliefs. He was extremely conscious about his lack of formal education and always cherished a strong desire to do something in the field of education, having understood its importance in his own life. He was a devout Hindu, famous for his honesty, integrity, hard work and tenacity. It was probably because of these sterling qualities that he soon began to be recognized in the business world as a man of integrity. He passed away on 8 April, 1980. Prohibition is one of the Gandhian ideals for which he fought for about 15 years of his life. He fought tooth and nail against the Country Liquour Houses, Toddy Houses, Opium and Marijuana dealers of Aminabad for which he and his family members had to face several threats and attacks. Despite these obstacles, he fearlessly continued to spearhead the movement against these enemies of humanity. Finally all these people had to shut shop in Aminabad. He was particularly attracted towards Education since it was the only way in which society can be reformed permanently. © 2019 Shri Ramswaroop Memorial Public School All rights reserved.